Informed by leading industry research, Rocky Mountain Institute and the Green Production Guide collaborated on a new report titled Lights! Cameras! Clean Energy! 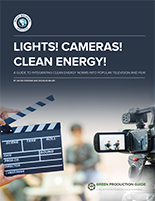 : A Guide to Integrating Clean Energy Norms into Popular Television and Film Production Content to help television and film production companies integrate clean energy themes and ideas into on-screen content. Production companies can use the recommendations to determine how they can develop characters, storylines, and visual imagery that more accurately present clean energy to their audiences and make it more relatable. The guide also encourages film schools, film festivals, and city, state, and national film offices to help promote increased use of clean energy storylines in productions. Watching the hit movie A Star Is Born the other night, I was struck by one scene in particular—not because of Bradley Cooper’s acting (which was fantastic)—but because of the spinning wind turbines behind him in the bright sunshine of the Arizona desert. Somehow, the rows and rows of turbines elevated what was already an emotional moment for the character, Jackson Maine. And while it could have been simply an aesthetic choice on the part of the director (Cooper, again fantastic), it may have been intended to provide insight into the generosity and savviness of Jackson’s brother, Bobby. That’s as far as I will go on the plot…no spoilers here! But this led me to ponder: How many mainstream movies and TV shows do we see with clean energy in the background, let alone in the storyline? Mostly, clean energy is treated as a niche topic and is often limited to documentaries with (comparatively) low viewership. Yet today, clean energy is a key source of employment and investment. We’ve had Homer Simpson working at a nuclear plant for nearly 30 years. Why don’t we have Jane Johnson working as a solar installer or Mack Mitchell implementing energy efficiency retrofits? Media is both a driver and a mirror of change in society. With a dearth of clean energy storylines and characters serving as role models in pop culture, audiences have a hard time connecting deeply with such characters. Think how the TV shows Will & Graceand Ellen changed our attitudes about LGBTQ issues and, arguably, paved the way for the US Supreme Court’s historic 2015 decision Obergefell v. Hodges that made gay marriage the law of the land. Now, new stories about clean energy need to be told that more accurately describe the world as it is. There is an opportunity for television and film productions to better represent and normalize clean energy across society by integrating the topic into the storylines, character roles and identities, and visual imagery of popular content. The guide’s recommendations build on ideas for promoting low- or no-cost pro-environmental behavior changes in home, office, and school settings in productions developed by thought leaders like the Environmental Media Association and Hollywood, Health, & Society. They do so by offering new tactics for linking clean energy to character roles and identities, dramatic situations, and plot development alongside props, background visuals, and scene transitions. This guide also builds on research by the US Department of Energy, Shelton Group, ecoAmerica, and Resource Media about the impacts of word choice and imagery in clean energy campaigns.